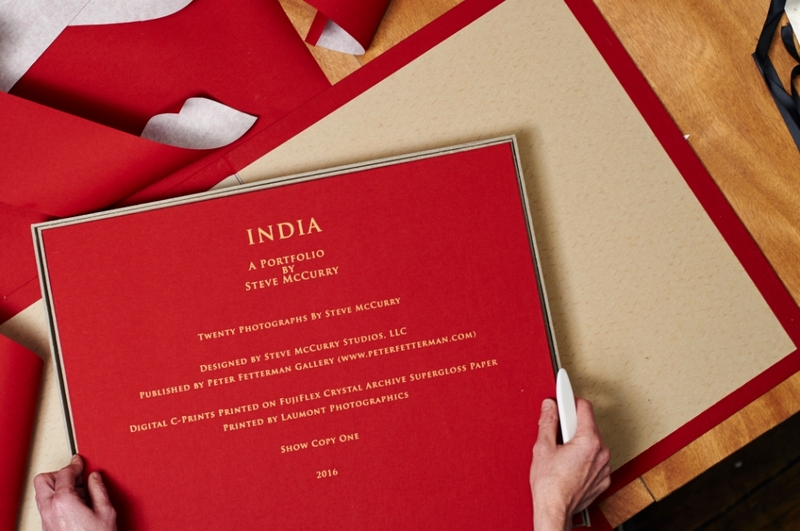 We were honored to produce 25 custom clamshell boxes for world renowned photographer Steve McCurry.These boxes include a custom screen printed inner lid, each numbered. The boxes have a rigid pocket containing handling gloves, in addition we letterpress the print list on 220lb Lettra. McCurry is is one of the most recognized photographers in the world having done countless assignments for National Geographic producing iconic imagery, most notably, The Afghan Girl. We had the good fortune to hear McCurry and Gary Knell, CEO of National Geographic speak at the Rubin Museum when they had a show of this collection of work. It has been a pleasure working with Steve’s team and we actively support his organization ImagineAsia, an NGO supporting the people of Afghanistan. Fetterman Galleries will be offering this special box set of prints.